It's not the change that gets you. It's the transition. Have you ever wondered what generational transition looks like in reality? What exactly does it mean, individually or corporately, when the U.S. Census Bureau reports there are now 320 million Americans? How does anyone begin to think about a world with seven billion people? Try comprehending not just how many human beings there are but the life stories, needs and aspirations those numbers represent. The "silent generation," ninety-five percent of whom are retired, gave way to "baby boomers." They in turn are making room in society and the workplace for Generation Xers and "millennials," also referred to as Generation Y. The name and time period for the cohort following the "millennials" has yet to be officially determined. By the way, what's the first Fortune 500 company built by millennials? It's Facebook where the majority of 8,000 workers are under 30. It's indispensable for any leader to understand the nature of a "liminal" moment where market positions are often occupied on both sides of a transition threshold. As one era ends and another begins knowing where to invest for the future becomes a consequential decision for leadership. What are the more important implications of varying generational behaviors, including values and technology, if you run a small business, large corporation, not-for-profit, medical practice, church, or institution of higher learning? As the calendar turns to 2015 I thought it might be helpful to see tangible examples of generational makeovers currently playing out in different facets of life. In 2013, Queen Beatrix of The Netherlands, age 75, decides it's time to step down after a 33-year reign. She turns the country's largely ceremonious Monarch over to her eldest son, Willem-Alexander, who became the first King of The Netherlands in over 120 years. His wife, Maxima, becomes Queen. Monarch to her son, Willem-Alexander (c). The new Queen Maxima (r), looks on. Larry Ellison is stepping down as Oracle's CEO, a position he has held at the company since he founded it in 1977. Ellison, 70, is the world's top-paid CEO, bringing in $78.4 million last year. Technically, his salary is only $1 -- he gets paid in company stock options. He's the fifth-richest person in the world, with a net worth of $51 billion, according to Forbes Magazine. 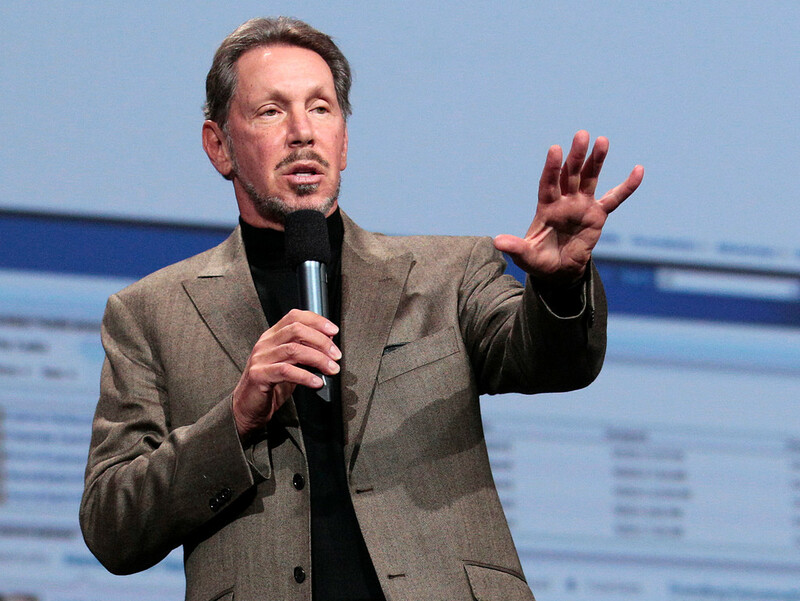 Oracle founder and CEO, Larry Ellison, moves aside. Safra Catz, 53, and Mark Hurd, 57, Ellison's top lieutenants (below), will replace him as co-CEOs. Catz has been Oracle's president since 2004, and Hurd joined Oracle after his unceremonious ouster as CEO of Hewlett-Packard in 2010. Safra Catz (l) and Michael Hurd (r), new co-CEOs of Oracle. Jay Leno's last episode as host of NBC's "The Tonight Show" on 6 February 2014 scored the program's most-watched episode in more than 15 years. After 22 years as host, Leno, 64, turned over the reins to Jimmy Fallon, 40. You may not have heard of Cedar Crest College, Allentown, PA. Cedar Crest is a liberal arts school for women with a 46 year-old president, Carmen Twillie Ambar. (The average age of a college president is 60). President Ambar, who was elected in 2008, represents a new generation of educational leadership. After all it takes a lot of energy to continually raise money for scholarships, endowments, physical plant improvements and new buildings. Dr. Ambar holds degrees from Georgetown University, Princeton University, and Columbia University Law School. 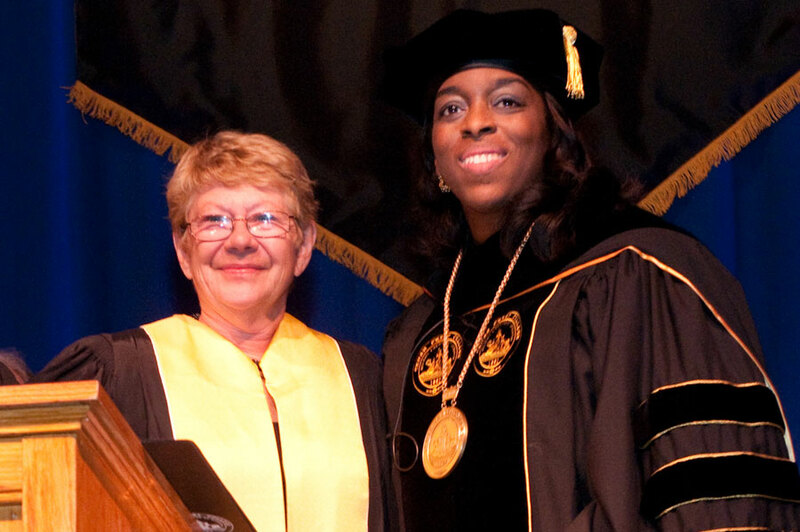 President Carmen Twillie Ambar (r) as Cedar Crest College's 13th president. At the age of 76, Jorge Mario Bergoglio, who was born in Buenos Aires, Argentina, on December 17, 1936, to Italian immigrants, became Pope Francis, leader of the 1.2 billion member Roman Catholic Church. Pope Francis succeeded Pope Benedict who was 85 at retirement. Pope Francis (l) and Pope Benedict (r). While Pope Francis has drawn a lot of attention for his outspokenness on a variety of subjects, most recently his public criticism of Vatican bureaucracy (Roman Curia), it could be that another important driver of revisioning church leadership is taking place elsewhere in the system among a relatively younger generation ascending to the offices of bishop and cardinal. Pope Benedict XVI (r) in 2012. 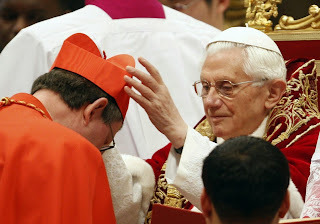 An example of that transition is Cardinal Woelki, a native of Cologne who was ordained for the priesthood there in 1985, receiving his red hat from Pope Benedict XVI in 2012 (above). At the time he was the youngest member of the College of Cardinals at age 55. For all the inroads made by digital sources the past five years most U.S. households still get their news from a nine-decade old technology, television. According to Gallup surveys, 55 percent rely on TV for current events followed by the Internet with 21 percent. Newspapers and other print publications are next with nine percent. Radio has a six percent share of the news audience. With the future in mind ABC News decided it was time for a redo on the set with long-time World News anchor Diane Sawyer, age 69, giving way to 40 year-old David Muir. Diane Sawyer (l) retires and David Muir (r) now anchors ABC World News. There are 5.5 million family businesses in the U.S. contributing 57 percent of Gross Domestic Product ($8.3 trillion). They are also responsible for 78 percent of all new job creation. According to Bloomberg BusinessWeek 35 percent of Fortune 500 companies are family controlled. The average life span of a family-owned business is 24 years (familybusinesscenter.com, 2010). About 40% of U.S. family-owned businesses turn into second-generation businesses, approximately 13% are passed down successfully to a third generation, and 3% to a fourth or beyond (Bloomberg BusinessWeek, 2010). From generation to generation, or not? Family-owned businesses are going through generational transition, too. The consulting firm, Accenture, released a study in 2013 on how to stay a step ahead of changing consumer behavior. Its premise is that new sources of growth are needed for more segments of the economy. The report underscored that "fast growth" is not a path to the future. Young adult markets do not seem to be a solution either as job and wage growth are proving not to be the same thing, at least for recent hires. College debt delays the purchase of housing and big ticket items such as autos and appliances. The most fertile ground, says Accenture, is changing consumer behavior or taking advantage of behavior that is already changing. The impediment to that approach is using old business models to address new buying patterns among all age groups. a hybrid model in search of proven success. Do you and others understand that significant changes in demographics (i.e., age, household income, ethnicity) and consumer behavior (social media, buying habits) are not over the horizon, but already here? Have discussions been held as to what those changes could mean for your field of endeavor? How will you reach new customers and build profitable relationships that are more beneficial than your competitors? How will you hire, train, engage, and retain the next generation of workers? In the coming year what should you be doing personally, and organizationally, to make way for a tomorrow that's already here?